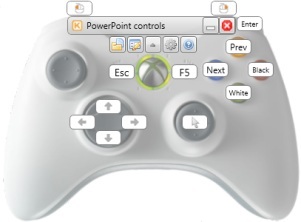 You can use Keysticks to turn a wireless Xbox 360 controller into a slide changer for Microsoft PowerPoint. It lets you navigate through your slides by pressing buttons on the controller instead of breaking off from your audience to press a key or click the mouse. You can also control the pointer, click and right-click, use the arrow keys, press Enter, and blank the screen. 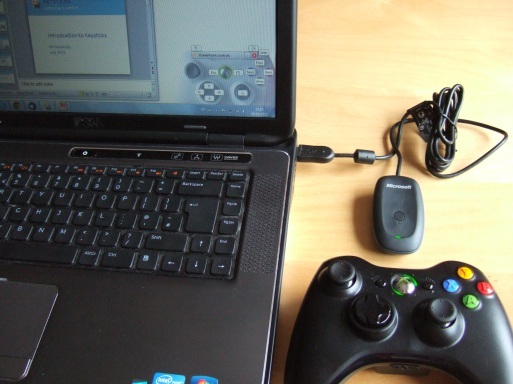 The wireless Xbox 360 controller communicates with your PC or laptop via a Wireless Gaming Receiver which is a small device that plugs into a USB port. If you don't already have one, see the Download page for more information. Keysticks then maps the inputs from the controller to the standard keyboard shortcuts for PowerPoint. For example, it makes pressing the Start button equivalent to pressing the F5 key, which starts the slideshow. Similarly, pressing the X and Y buttons on the controller is like pressing PageDn and PageUp on the keyboard, which navigate between slides. 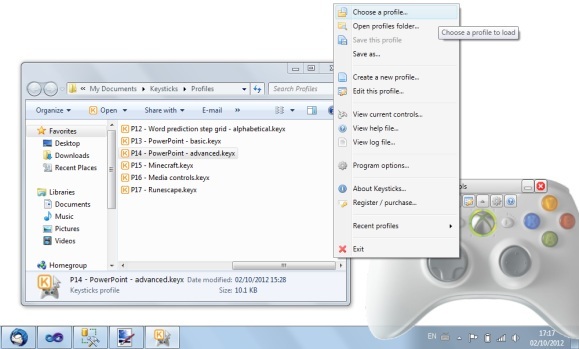 These controls for Microsoft PowerPoint come with Keysticks, so once you've installed the software, you can load the PowerPoint profile by just double-clicking it, or using "Choose a profile..." from the program menu. You'll see a window shaped like an Xbox 360 controller which shows you what the controls are. Once you're familiar with the controls, you can minimise or close the controller window. If you haven't seen it yet, you can watch our video which includes Keysticks being used to control PowerPoint.